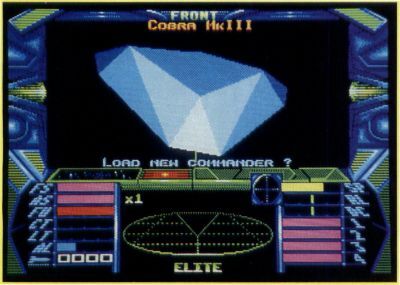 In Elite you take command of a Cobra Mk III spacecraft. She is fast, maneuverable and pretty well armed. Further, because of her versatile construction, weapons and tools can be added to the ship as funds permit. The basic idea of the game is to make a living (and get rich if you can figure out how) as a trader, roaming among 2,000 planets spread across eight galaxies. The planets are ranked according to the type of government they have (corporate state, dictatorship, anarchy, etc. ), the type of economy (medium industrial, poor agricultural, etc.) and the technology level. All of these factors are important. For example, when approaching planets with a stable form of government, you are less likely to be attacked by pirates (did I mention the pirates?). On the other hand, the less stable forms of government offer more chances for a fast buck (ain't it the truth!). The type of economy comes into play when deciding what to ship and where to ship it to. Agricultural goods will be more reasonably priced in an agricultural world and will fetch a better price in an industrialized world. Further, agricultural worlds have little use for highly advanced technological goods, and so will offer little for them. The technology level is important because certain items are only available at worlds with a technological rating. A good example is the expensive galactic hyperdrive, which is necessary to proceed to the next galaxy and can only be obtained at worlds with a technology rating of 10 or higher. Playing Elite is relatively simple. You begin the game at a space station orbiting the planet Lave (you don't actually land on planets, just dock with their space stations), with 100 credits to your name. 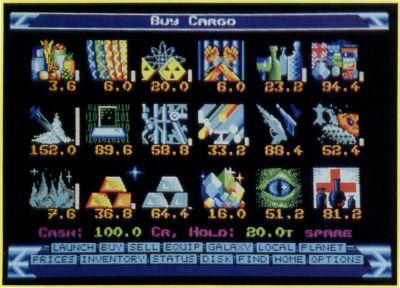 You can then check what's available at the station and use the money to buy items you think you can get a good price for at one of the worlds within seven light-years (your range in space). You can call up a galactic map (not real helpful) or a local map, which shows the nearby planets. Placing the cursor on the planet you want to know about and selecting the "Planet" item from the control panel will tell you important information about that destination. Then it's time to launch into space, where you can practice docking with the station (not a non-trivial maneuver, these babies rotate) or select your destination and jump into hyperspace for the trip there. Once you get into space, things get interesting. Your control panel tracks things like shields, fuel laser temperature and other variables. You have a compass for locating planets/stations, and a 3-D scanner that shows objects in space, including whether they are above or below you. It's also out in space where you have to learn to fight or flee from the pirates (did I mention the pirates?). In the early stages of the game, it's best not to fight, but to instead seek the protection of a space station. The galactic cops are well equipped and do a good job of protecting honest traders close to space stations. Even so, it's best to upgrade your energy banks and lasers (maybe add an energy bomb) as soon as possible. Pirates tend to leave well-equipped traders alone. There are also some hostile aliens out there that shoot at anything that moves. There are essentially two ways to get ahead in Elite. The first is as an honest trader. This is slow but relatively safe. (Yes, you can save the game!) The other way is to deal in contraband goods and shoot up honest traders. The contraband goods are fairly easy to buy, but not so easy to sell, unless you know where to look. Both of these actions, unfortunately, get you blacklisted by the cops; so they may have an unwelcome reception committee waiting for you the next time you dock. 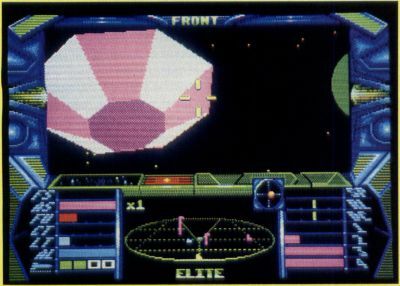 Elite's graphics are incredible. It has simulated, multicolor 3-D, including scrolling star fields, animated with unequaled smoothness. The sequence where the galactic cops came out of the space station to blast me to bits was unbelievable. Commands are easy to give: You can work with the joystick, mouse or keyboard. The downside is that the controls are set up in an odd way. Imagine a spacecraft that can climb and dive, but can't turn! That's right, moving the mouse left and right (or the joystick, or using the arrow keys), just causes the ship to roll. While I finally discovered a trick that let me line up on the space station and dock, battles with pirates were exercises in frustration because I couldn't turn my ship to line up the nose-mounted laser. And remember, this review is coming at you from a seasoned space arcader. It turns out that you can adapt the odd control system, and I suppose that I shouldn't have been battling with pirates in the early stages of the game anyway. Another problem was that I couldn't get the auto-centering to turn off, at least, under joystick control. Finally, some of you may be wondering how an honest, law-abiding citizen like Dave Plotkin got himself blown away by the galactic cops. Well, it's like this. If you shoot at a space station, the cops get really mad. When using the mouse, you use the left mouse button to fire and the right mouse button to control your speed. Unfortunately, after switching from the joystick to the mouse to try to line up on the space station better, I attempted to slow down by pressing the right button. Yikes! The lasers fired. Ooops, sorry, guys. Guys? Hey, wait a minute, guys. Boom! End of game. This was repeatable, and so a word of warning: If you use the joystick, don't use the mouse. This bug is unfortunate, since the joystick works better in space battles, but the mouse (sluggish as it is) still works better for the tricky maneuvering around the space station. There are two key things to remember about Elite. First of all, it is a trading simulator, not a combat simulator. Your ship is not designed to outfly or outfight the pirates (did I mention the pirates? ), hence the roll vs. turn maneuver. If you can survive until you add some awesome weaponry (like the military lasers—very few people mess with you if you have a couple of these mounted front and rear), you can go marauding. But don't mess with hostiles until you are better equipped, unless you like short games. The second thing is that Elite is not designed to be finished in a short time. One individual I know has been playing for four months. He's got lots of cash, an energy bomb, heavy-duty weaponry, extra everything and has just reached Galaxy 3 (of eight possible galaxies). You could make a career out of playing Elite. Overall, Elite is a good game that could be less frustrating if the ship could turn. The game has challenge enough without that wrinkle. If you have a low frustration level, you might want to try it before you buy it. But if you live for 3-D graphics, role-playing and lots of arcade action, check this one out. David Plotkin has been involved with Atari computers for about ten years and is a frequent contributor—of both reviews and software—to ST-LOG and its sister publication, ANALOG.